At Point McKay Dental your dental health and safety is important to us. Now more than ever, patients have questions about their risk for infection when they visit a healthcare practitioner of any kind. Our goal is to exceed the Alberta Dental Association and Canadian Dental Association safety and sterilization guidelines, with the use of hospital-grade sterilization equipment and by following strict sterilization practices. 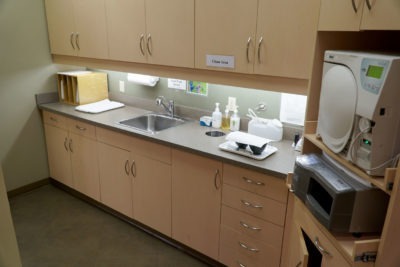 All of our dental team wear gloves, face masks, and protective eye-wear at every appointment. We use disposable products as much as possible and sterilize tools that are not disposable. Autoclave (pressurized steam): All dental instruments and handpieces (drills) are sterilized in a high-pressure steam autoclave after each use. This process is the standard of care. Our computerized autoclave warns us in the event of an incomplete sterilization cycle, and we have protocols in place to correct such issues immediately. As an added precaution, we also use an external biological indicator test to ensure that our autoclave is functioning properly and producing sterile instruments. Please do not hesitate to ask us at your next visit or contact us directly at (403) 283-7829!